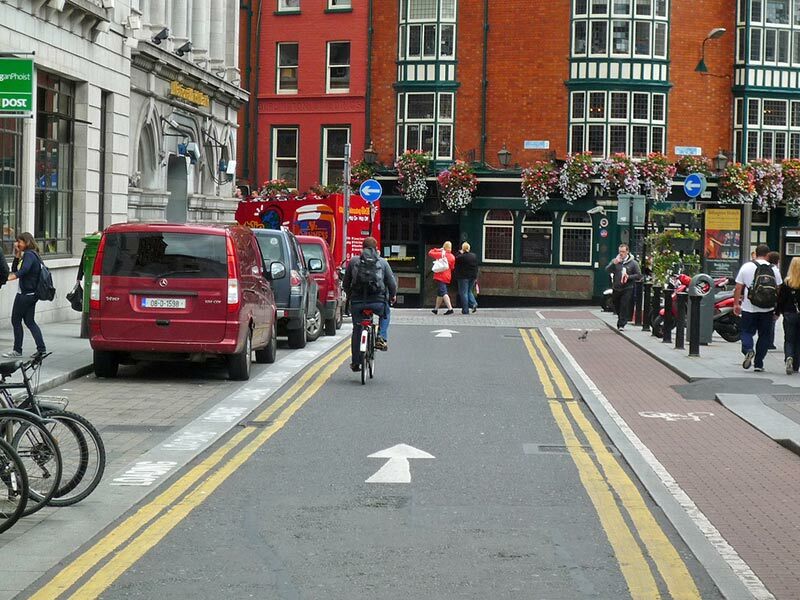 Turning one way streets into one way (car) and bicycles the other way. Counter flow cycle path in Dublin. Clearly segregated. 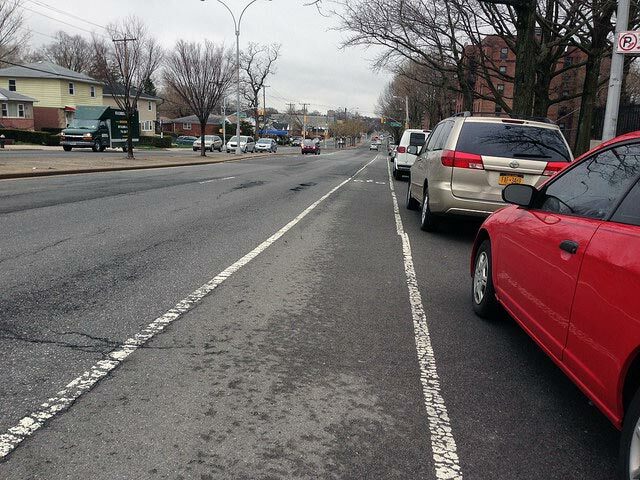 The easiest cycle lane is to put a dotted white line on a road. This serves as a ‘guide’ for motorists and cyclists. 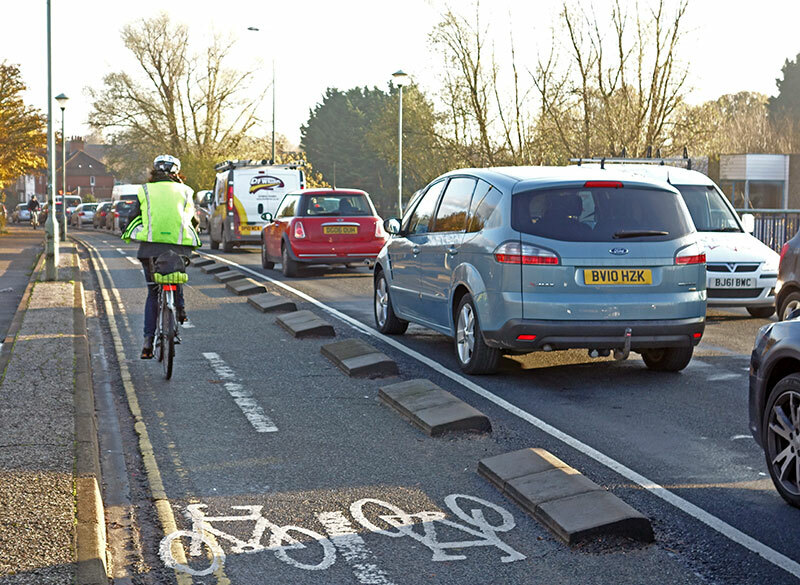 Increase cyclists’ comfort and belonging on the carriageway. Enables cyclists to pass stationary traffic in traffic jams. 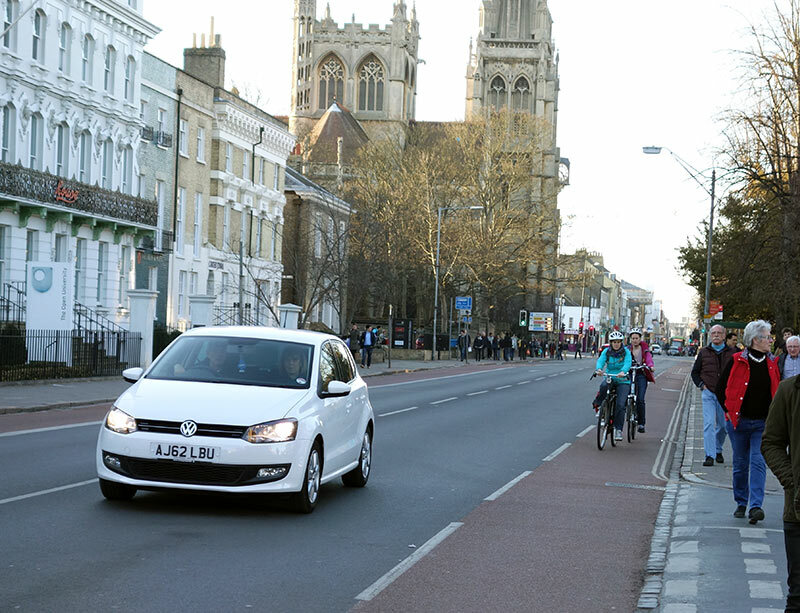 Makes cars more aware that cyclists may be using roads. Cyclists may be encouraged to move on the inside of moving cars and lorries which could be dangerous if vehicles veer inward or turn left. Anecdotal evidence suggests cycle lanes may encourage cars to pass closer to cyclists because they feel that as long as their vehicle is not in the cycle lane, they can get closer. 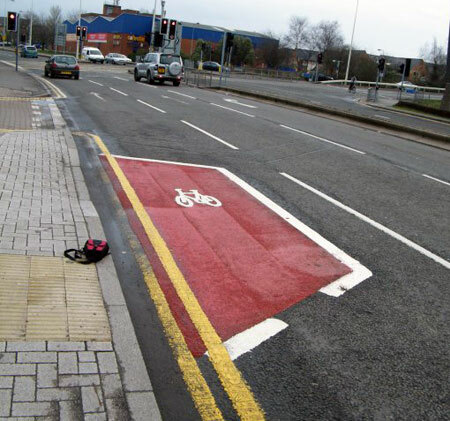 Overall, I support this kind of cycle lane. It is usually better than nothing. More than anything it reminds drivers of our right to be on road. At peak time, roads are frequently congested, and this makes it easier to pass stationary traffic. However, I am aware of their limitations. Just because there is a cycle path to left of road, doesn’t mean I will always risk undertaking. You have to use your common sense. It depends on the road. I’m keener on cycle lanes in city centres than on the open road. Every 100 metres you have to give way to cars turning left or right. Basically it is a cycle path with continual obstacles. In its defence, many other cyclists still prefer using this disjointed shared use cycle path rather than using the main road. If I cycled very slowly, I may prefer the same. 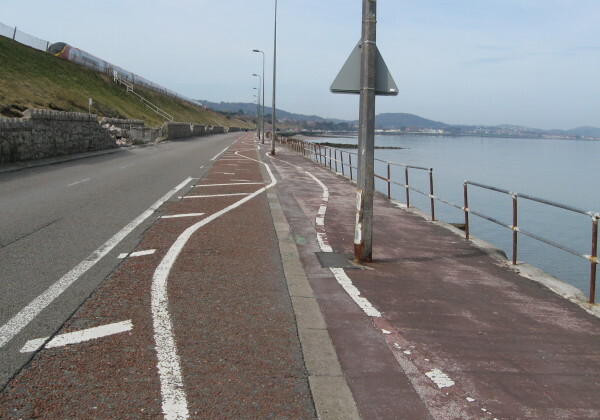 But, I’m just glad this kind of cycle path is not compulsory. Perhaps it is better than nothing as cyclists get a choice depending on their preferences. This is the bottom of a steep hill. On a bike you can go down at 30 mph. But, then have to slam on the brakes because the road is narrowed to the width of one car. In theory, there is a cycle path to the left, but it is lost in the undergrowth. Even if they cut it back, there are lots of sharp stones from the fields. To slow down speeding motorists, traffic calming measures have been installed so there is only room for one car to pass. 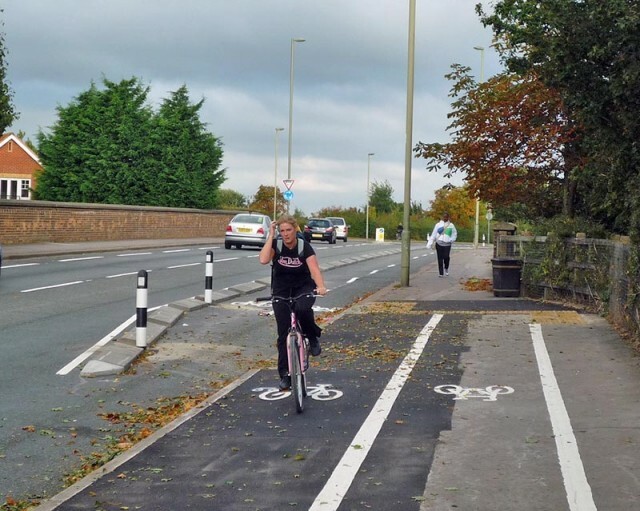 It is a bit annoying because it creates friction, when instead a cycle path could be installed for cyclists like this below. Traffic calming with space for cyclist. Though ironically for this pic, the cyclists didn’t use the cycle filter! 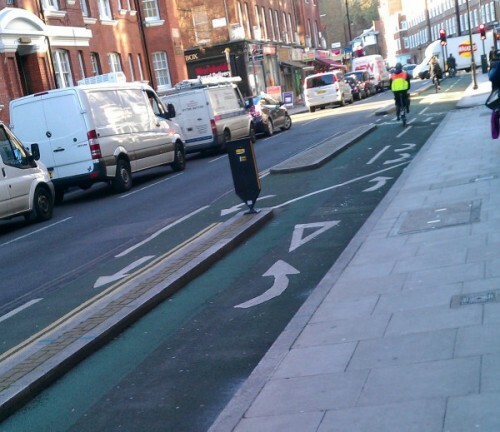 This is a rare example of a cycle lane designated by a solid white line. To reinforce the no-parking rule, there are double yellow lines too. Mandatory cycle lanes seem quite rare, unless they are on double yellow lines. Shared use paths – when cyclists are allowed to go on pavements that have been marked for shared use. 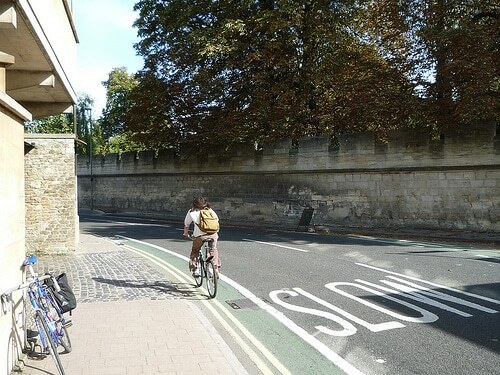 Sometimes pedestrians and cyclists may be segregated by single white line. One of the biggest complaints about cyclists is when they use the pavement. 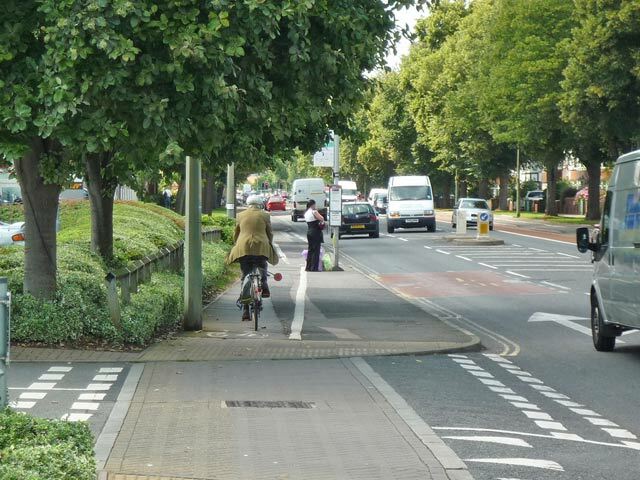 Many pedestrians (especially old people feel uncomfortable when people cycle on the pavement. 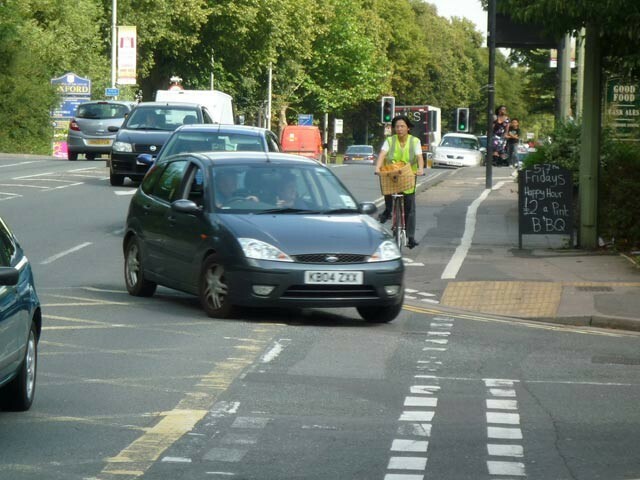 Shared use paths often aggravate this by taking a pavement and painting a white line on as a shared use cycle path. Where possible I tend to avoid these. Unless it cuts a corners, makes journey quicker or is much safer. When using it I do remember pedestrians should be given priority and go slow. But, also I’m not keen on shared use cycle paths because pedestrians have been my biggest cause of accidents. On three occasions I have been knocked off in shared use cycle paths because pedestrians suddenly change direction without looking. I wasn’t going fast, but it’s something you have to be aware of. Short cycle paths are often quite bizarre and appear all other the place. 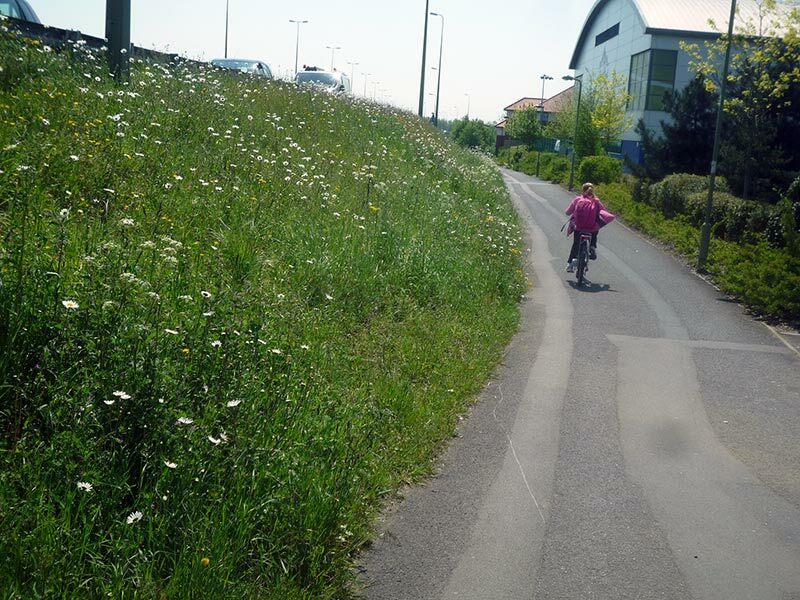 There are quite a few entries for competition of shortest cycle path. 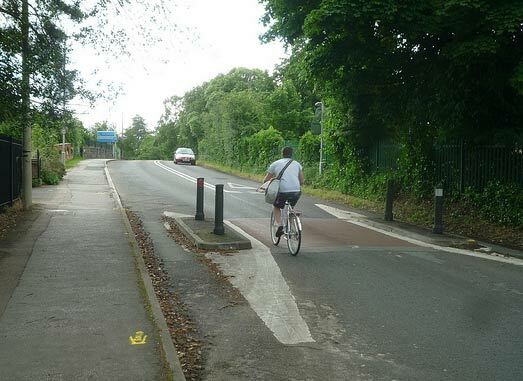 A key issue with cycle paths is are they integrated with paths and roads. 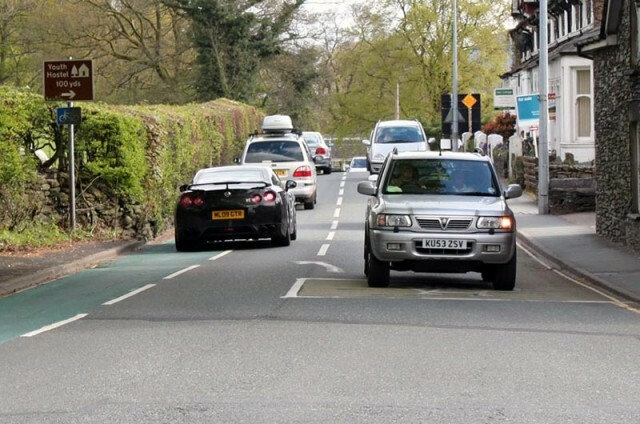 Often a cycle path is designed and it goes straight into a parked car or fades away when you need it most. 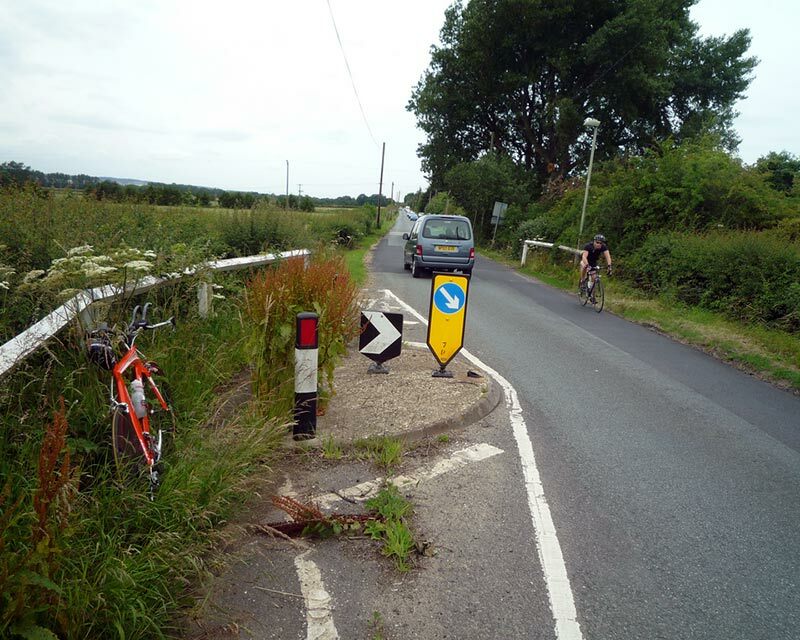 Cycle path abruptly ends, making it difficult to join a narrow road of fast moving traffic. Is it compulsory to use cycle paths? 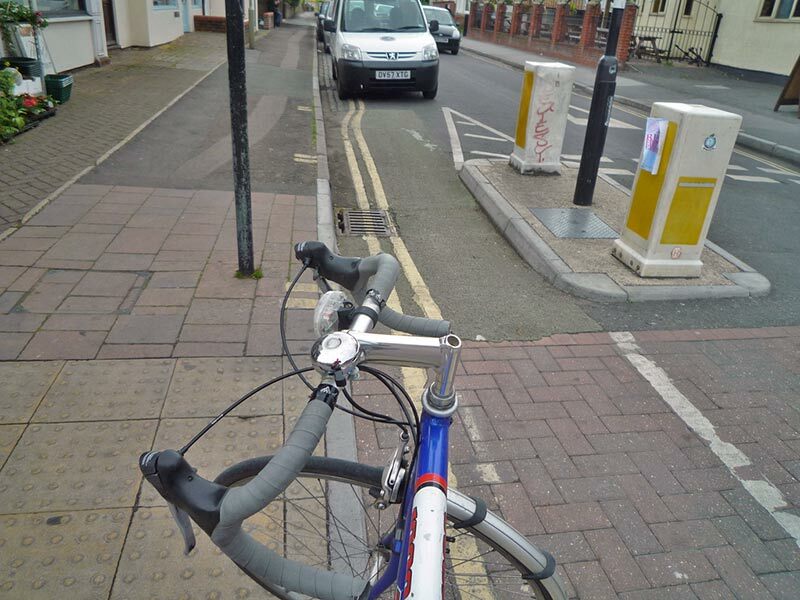 Sometimes I will choose not to use cycle lanes – especially if they are half a pavement. I don’t think it is appropriate to be sharing pavement with pedestrians. But, you will tend to get some angry motorist that you are on the road. 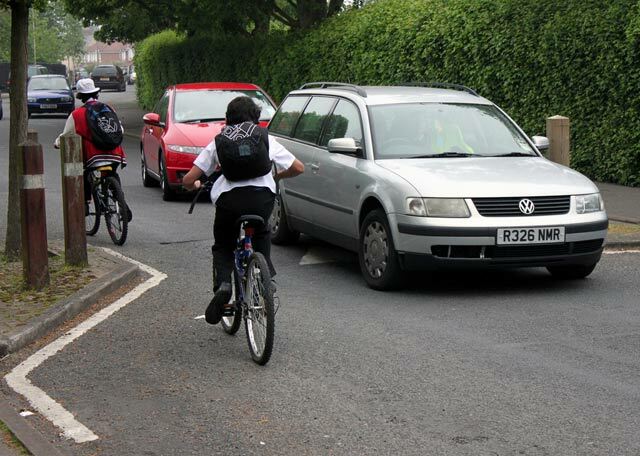 It can feel like caught between two rocks – the pedestrian is annoyed you are on the shared use pavement or the motorist annoyed you’re on the road. But, I just use common sense and choose most suitable place to cycle. If people get annoyed because they sometimes have to slow down for a few seconds, it is just their impatience. 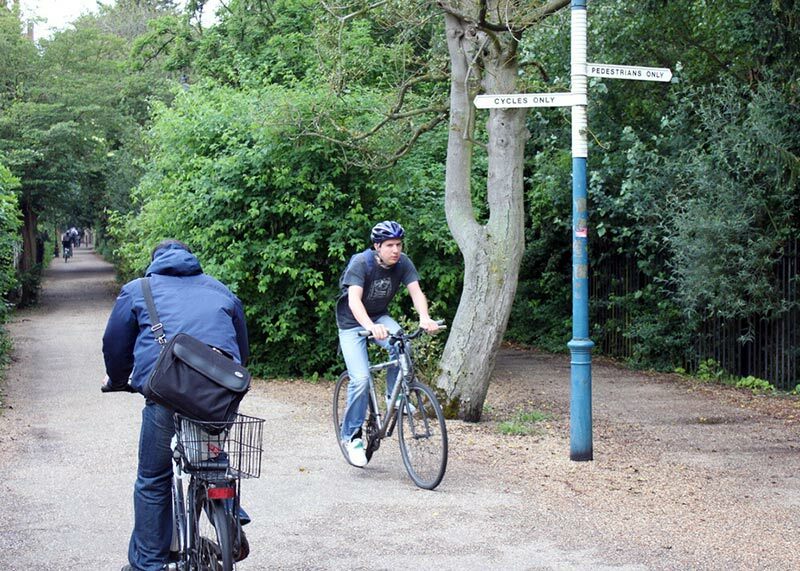 The national cycle network. 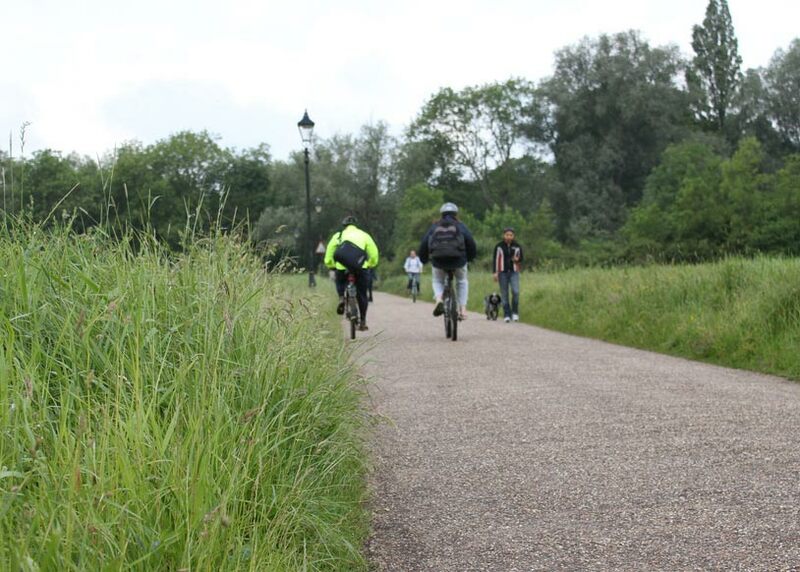 A combination of custom cycle paths, quiet roads and scenic traffic free paths. Some cycle paths are very scenic and a real joy to ride. Hopefully the network will continue to grow. They encourage beginner cyclists, nervous of using roads to get started. This is wide enough to allow cyclists and pedestrians to mix. Cycle lane or pedestrian lane. 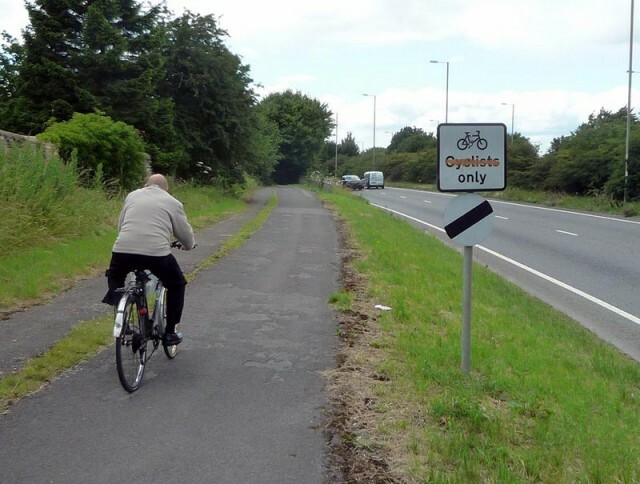 No one takes notice of sign, but a great cycle path. A good cycle path by side of busy A40 dual carriegeway. Feel free to post your favourite cycle facility in comments! 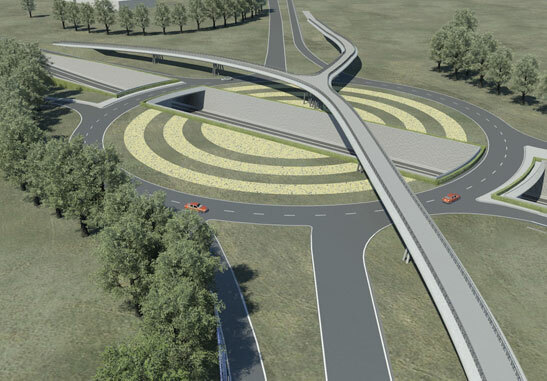 Belgian cycle path to take cyclists over a big roundabout. 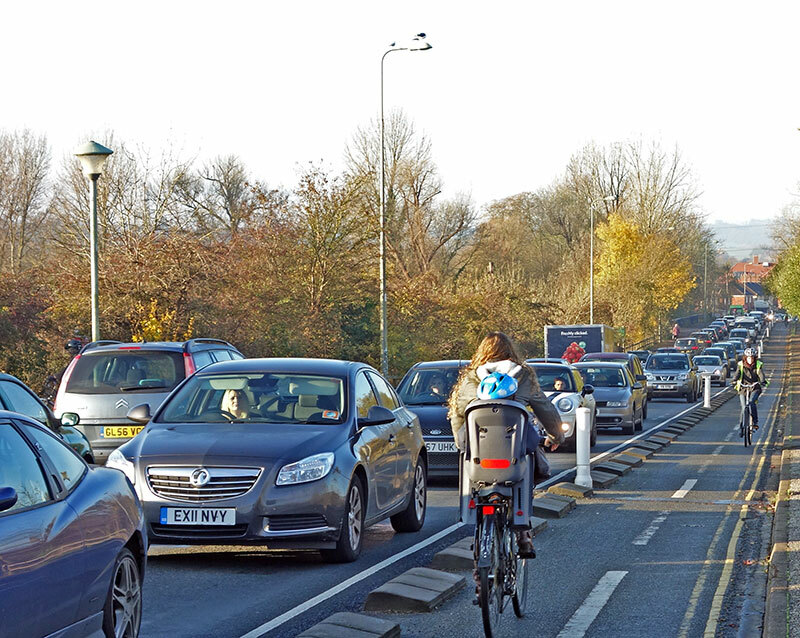 One of the worst shared use cycle paths in Oxford is on the London road on the way out through Headington. After all the recent disruption of resurfacing the road they’re painting one on the other side where you used to be able to ride in the bus lane without risking the ire of the motorists. Such a shame. Glad you’re thinking about it but you’re a LONG way behind the infrastructure advocates. 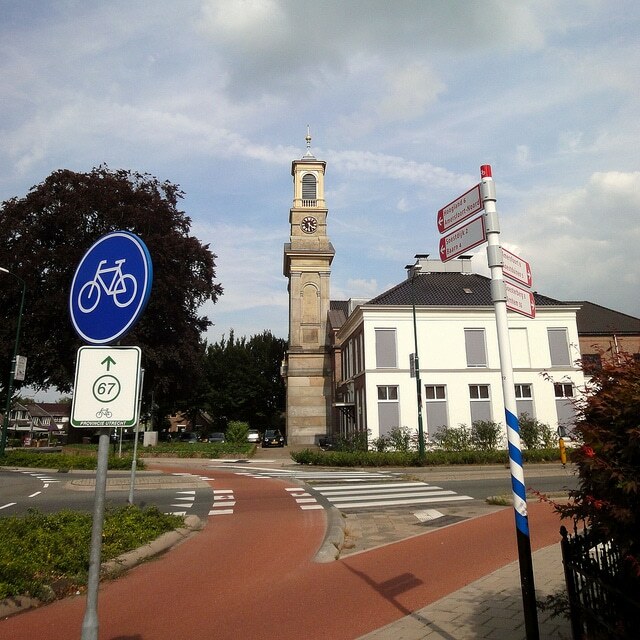 I suggest starting here with https://bicycledutch.wordpress.com/ and moving onto http://www.aviewfromthecyclepath.com/ then move onto the wider ‘livable streets’ message into which utility cycling fits perfectly http://www.streetfilms.org/. “the most obvious differences they discovered was that the Dutch cycle on the right rather than the left” – I don’t get this part. 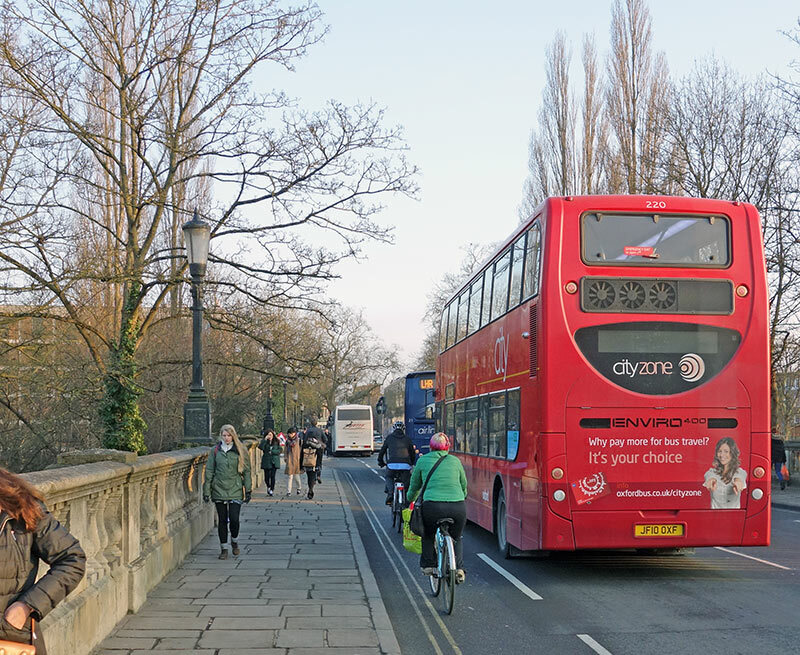 Surely since the Dutch drive and cycle on the right, and in the UK you drive and cycle on the left, there should be no difference? Or were they hinting at driving on the right being in general better for some phisiological reason? That would surprise me. The link unfortunately goes to some “facility of the month” page, which probably has changed, so it doesn’t give me any help in understanding. I wonder how often you cycle with small children (either on their own bikes or on a child seat on your bike). I found in that situation suddenly shared-use pavement cycle paths become very appealing. Not ideal, but better than the alternatives available. What a shame we are (almost) always given the choice between two crappy alternatives. 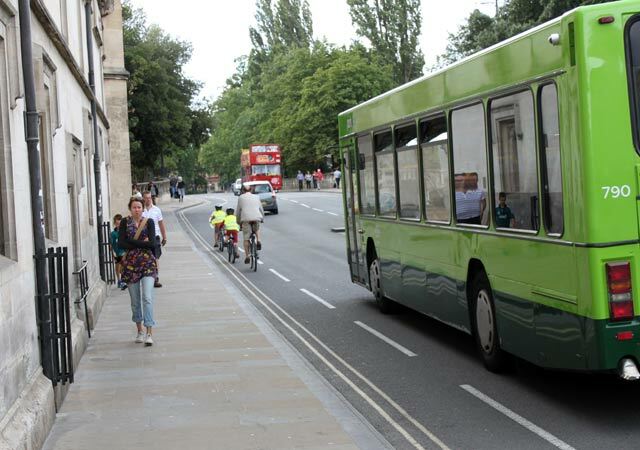 Share with the drivers and their buses and lorries, or share with the pedestrians. And inevitably either party will become annoyed at my presence as I “get in the way”. 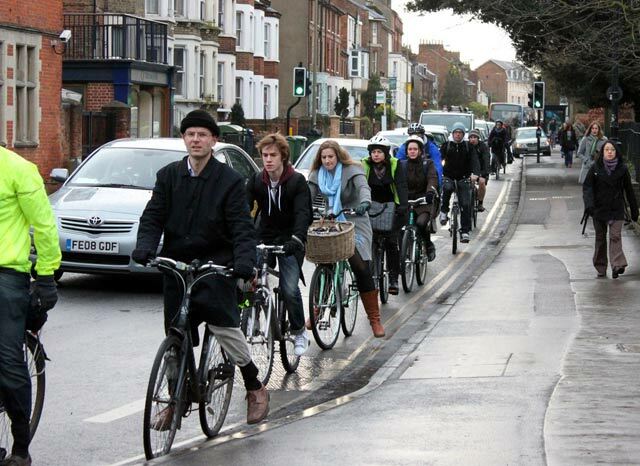 Definitely, cyclists should be given a separate and well developed cycling lane. A cycler could be anyone, a perfectionist, a newy or even a child. Such separate lanes would make the cyclist feel safer, especially the kids. Also, the lanes should be well connected with each and every rod, circle or turn. Sufficient space should be provided for the 2-way cyclers. There should be no choice between any alternatives. Cycling lanes are a must. Safety comes first for everyone! Why would anyone choose to use the cycle lane rather than the main part of the road ?